Little Pieces of Embroidery – Covered Buttons and More! Do you ever just want to stitch a little piece of embroidery, but then you don’t know what to do with it? Maybe you have little embroidery samples that you want to make into something, but you don’t know what. Perhaps you have some old vintage embroidered linens that are worn out, but still have usable and pretty bits of embroidery on them? Well, that are lots of things you can do with little bits of embroidery. Two finishing approaches that come to mind and are pretty wildly popular are jewelry and covered buttons (which can be used in so many ways). Both are a terrific medium for showcasing small bits of hand embroidery, and covered buttons? Well, they’re one of my favorite ways to finish little embroidered bits. The question is, though, what do you do with a bunch of covered buttons, once you’ve taken the time to make heaps of them? And, trust me, if you get into making embroidered covered buttons, there’s a good chance you will make heaps of them, because they’re awfully fun! So here are some little finishing ideas for small pieces of embroidery, whether you’re using designs you’ve stitched specifically to cover a button make a piece of jewelry, or whether you’re recycling older pieces of embroidery, like vintage embroidered flour sack towels that are past normal use, but still have some decent bits of embroidery on them. Let’s talk covered buttons first, because they’re so versatile! By covered buttons, I mean buttons created using pre-bought forms or button-making kits. The button forms come in various sizes, from small to large, and depending on what you want to do with your covered button, any of the mid-range to large sizes (say, 3/4″ – 1 7/8″) can work great for little embroidery projects. Once you’ve done the embroidery and covered the button, there are heaps of ways you can use your finished little masterpiece. The picture above, and those following, are from covered buttons made by Caroline Clarke. She shared photos of her beautiful buttons over in the Needle ‘n Thread Community on Facebook, so I asked her if I could share some of them with you, to inspire you. I love the variety of her designs! Each one is a little embroidered gem! So, what can you do with an embroidered covered button, once you’ve created it? Well, well, the ideas are pretty endless! …and I’ve seen smaller embroidered covered buttons fixed onto jumbo paperclips, to use as bookmarks. I’ve seen tiny ones – 5/8″ embroidered covered buttons – made into earrings, even! I’ve used embroidered covered buttons to decorate retractable lanyards – like the one in the photo above. These make terrific scissor pulls. You can loop the end of the lanyard through one of the finger holes on your scissors, and clip the lanyard to your shirt, or on the edge of excess fabric on your embroidery frame, or to a chart holder near your needlework or something similar. I like to clip a retractable lanyard with scissors onto my shirt collar while I stitch – it keeps my scissors within really easy reach, without having to fumble about for them. That said, be careful of the tips! Since lanyards are often used for name badges at hospitals, schools, and places of business, you can make terrific unique and personalized gifts for friends who use them. You can stitch a favorite animal, flower, short saying, decorative initial – whatever you want to personalize the lanyard for the user. And, hey! What about those name tags you wear during needlework tours and workshops and the like? This is a fun way to personalize yours to wear on a lanyard! Some stitchers use larger embroidered covered buttons to make necklaces, by attaching jump rings to the top of the back of the button and running a chain, ribbon, or leather strip through the jump ring. And, for those who like to knit or crochet, a larger embroidered covered button makes a great accent on knitted hats (on the front side of a beret, for example, or a baggy beanie) or for the practical use of buttoning a knitted or crocheted cowl. So, lots and lots of uses for small embroidery, when made into covered buttons! One of the best things about making embroidered covered buttons – besides the variety of ways you can use them – is the fact that the embroidery projects are always small, so they don’t take a lot of time, from start to finish! If you’re curious about embroidering your own covered buttons, or you’re looking for little designs that you can stitch up, you’ll find a whole section on embroidering covered buttons in my e-book, Lavender Honey & Other Little Things. Many of the photos above come from projects in that book. They’re all fun to stitch! And I show you step-by-step how to stitch them and then how to easily finish them into covered buttons. But, truthfully, you don’t need Lavender Honey to venture into embroidered covered buttons. You can find the button forms for covered buttons at practically any sewing store, in the notions section. Let your imagination dictate the design! For those who happen to live near Castleford, England, Caroline Clarke will be teaching a workshop on embroidered covered buttons at Sew Susie Bloom, a haberdashery shop there. You can find out more, or contact them, through their Facebook page. Covered buttons aren’t the only use for little bits of embroidery. If you’re into making wearable art – notably jewelry – out of little pieces of embroidery, you should check out Nunn Design. Becky Nunn has a magnificent collection of jewelry findings, perfect for making your stitched stuff into wearable art. I’ve been dabbling with ideas for jewelry-sized embroidery ever since discovering her collection. She’s got some magnificent stuff, and her findings come with instructions on how to finish and mount embroidery (or other textiles) into them. You can find her different bezels for making embroidery into jewelry here, but it’s definitely worth browsing through her site for other settings as well. No affiliation – I just really like her collection, compared to other jewelry findings for embroidery that I’ve seen on the market. If you want some really fun inspiration for small pieces of embroidery worked into jewelry, covered buttons and the like, check out Marg Dier on Instagram. She always has fantastic little pieces of stitching mounted as jewelry or covered buttons and more. Fun stuff! So, there are some ideas for using up little bits of embroidery or small embroidery projects! What about you? Do you have any further ideas for using embroidered covered buttons? Any tips for using up little bits of embroidery? Feel free to chat about them below, or to ask questions or suggest resources. Love all of these!! My son is an attorney and he likes to wear a fancy button on his suit pocket when he is in court. Fun! 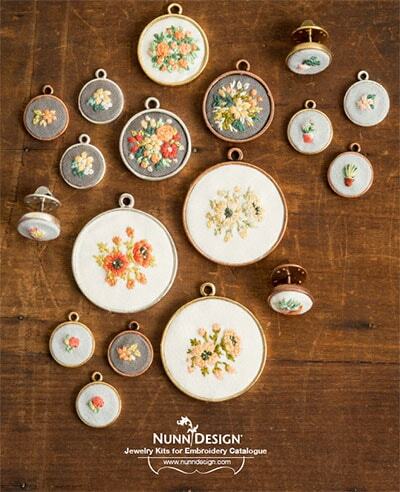 Becky Nunn has little lapel findings that you can mount embroidery in. They’re quite nice! What a great idea these embroidered covered buttons are really lovely, it’s given me ideas now that I’m finished my quiet book and looking for something new to embroider these would make lovely projects, I’m toying with the idea of embroidering my clothes just to make them stand out a bit and adding buttons was one of my ideas so I could cover them with small embroidery. Thanks for sharing these lovely covered buttons with us and for the idea and the photos and links wonderful idea. I’ve been wanting to try some buttons/jewelry. Thanks for the link to Nunn Design. I really hadn’t been all that excited about the findings I’d seen. Buttons are a fantastic embellishment for quilts, and can even be used for “tying” a quilt. I never thought about using embroidered covered buttons, and can only imagine how wonderful an addition they would be! Hello Mary! Recently a friend “encouraged” me to make her a brooch, stitched with Brazilian embroidery, so I made her a small flower and bee; it turned out quite cute, I think! Now she wears it when working in the art gallery where her own work is displayed and sold! Brooches are another way to display small works of embroidery! wrapped on wood button molds and hand stitched. collect handmade buttons made as, “studio” buttons (if they are signed, not mass produced, etc.). Your subscribers may be interested in looking at beautiful antique buttons for their projects. There are local clubs, where both antique and studios can be found. Check out your States button societies! These you feature would add charm to any collection! I make bags and purses and embroidered buttons are the perfect way to finish them off. I’m looking for a source for compact mirrors on which you mount stitching or beading. I want to make the beaded one in ‘The Art of Bead Embroidery’ book. Any suggestions are welcome. Thank you so much, Mary. Your newsletter brightens my day. How well would the covered buttons hold up as active buttons on clothing given wear and tear and laundering? If it’s serious wear and tear, I don’t know. My sister uses embroidered covered buttons on dresses for her children – the heirloom sewing style of dress – and they hold up to gently laundering, but they aren’t rough and tumble clothes. I haven’t tried them on anything that takes serious wear or heavy duty laundering. I sew two covered buttons back-to-back and it can be a scissor fob or an ornament. Cover the stitching that attaches the two w/ a cord — Ta Da! Thank you very much. My friend was over the moon at the mention of her shop. So kind of you. I was so excited to read your suggestions for what to do with embroidered buttons! I was looking for more ideas. I started making buttons last year because they were fun and quick to make. Then, my husband asked me what I was going to do with them (he’s so practical!). I told him I wasn’t sure, I was just having fun. After thinking about it, I decided to take off the shank and glue a magnet onto the back, using them for refrigerator magnets and needle keeps. They’re so much fun to give as gifts! That’s just it – they’re so much fun to make. They’re addicting! But then, what to do with them? So many options! Love this idea, Mary! I have used covered buttons on many of the items I have sewed for many years. Funny that we don’t often think to actually use them on clothes, but they are beautiful on coats, vests, cuffs, as well as great fun on plain button down shirts, as well as embellishments on socks, and even as shoe clips. While reading this article, the thought sprang to my mind of an easy way to DIY finishing a tiny embroidery. If you have ever made a yo-yo, by gathering the edges of a circle and turning under a tiny bit of cloth and pulling it tight; just insert a piece of heavy plastic before pulling it tight. Experiment with sizes of circles to get it right and hot glue necklace cord and felt to cover back. Definitely inspiring creativity! Not just for knitters! Changing out the button(s) on a bought garment is one of the easiest ways to personalise it. I wouldn’t use an embroidered button on anything that was going to get regularly machine washed, unless I was willing to take the button off each time, but that still leaves lots of options! I always thought that putting embroidery into jewelry would be hard. Now that you provided a source for a video and very nice bezels, etc, the process is less daunting. I love the idea of stitching small pieces for a brooch or pendant. Thank you for sharing the link for Nunn Design. I just had an ‘Ah ha’ moment. Just as quilters carry around charm squares when they go to meetings, shows etc. You could carry around some finished buttons to give as spontaneous gifts to someone you appreciate. I love giving spontaneous gifts, don’t you, plus it makes the receiver feel special. Using multiple stitched buttons to make a necklace would be fun. If you search for button necklace images their are many different styles. Beading stores also carry ring bezels which you could attach a stitched button. I have a little rectangular hinged glass and brass ‘picture frame’ that I got at a needlework shop hop several years ago. It’s the perfect size for a bit of counted thread work over one. It’s maybe an inch by 1.5 inches and has a loop on the narrow edge for a cord/ribbon/necklace. I have several seasonal bits and bobs that can go in it. Very fun. I’m fascinated by the lanyard idea. I have to wear one at work (scan to get in the door, scan to use the printer…..). A pretty piece of needlework would make me much happier than the company issue rope.